Founded in 1972, our goal has always been the production of quality warmbloods to have as a friend and competition horse. We specialize in dressage, but have sold many successful eventers and hunters. We're slowly down sizing our broodmare herd but maintaining a few mares, primarily of Trakehner and Swedish bloodlines, proven producers of outstanding dressage, eventing and hunter offspring. We use our own well proven Trakehner stallions along with a select outside stallions with superior riding ability from outstanding International dressage and jumper bloodlines for our sporthorse breeding program. ~1995 (left-rightShannon, Jean, Erin, Roy & Jason. The proof of a breeding program must always come through the results of competition and here we have had great success. Our specialty is dressage and a large number of our sales horses compete in this field earning an incredible number of USDF Horse of the Year and Breed awards. We've added eventing back into our competition schedule with great success. 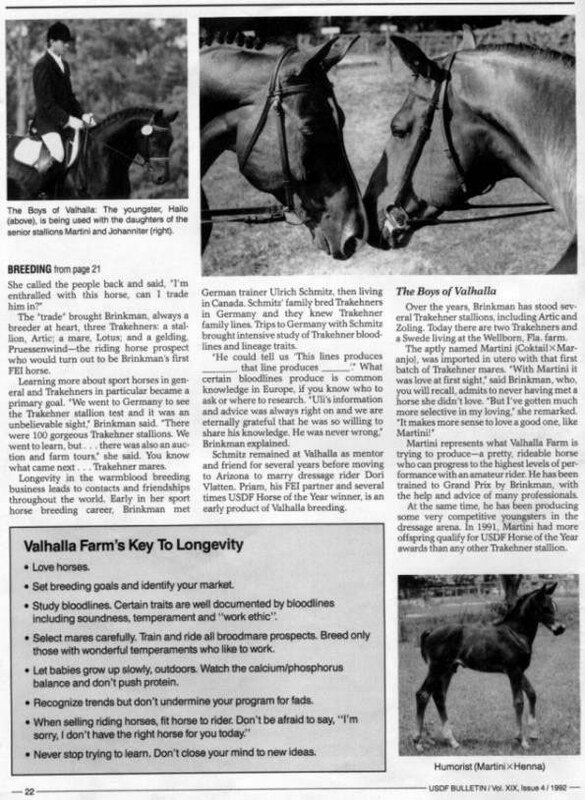 As the years have progressed, a substantial number of our Trakehner and Swedish homebreds have entered the hunter field, earning many championships.Although we breed with FEI gaits and quality in mind, our primary goal is to place our horses in loving homes where both horse and rider will progress to their own level at a comfortable speed. Quite frankly, not all FEI horses are the happiest, while a well loved first level horse not ever living up to his potential can be the most rewarding and rewarded of horses. The enjoyment and accord between horse and rider can be seen and appreciated at any level of competition. We consider this our breeding reward.